By Sophie Uliano, Well Being Journal, Vol. 24, No. 4. In the green cosmetics world, there has recently been a debate about the pros and cons of standard store-bought deodorant. Two terms have been linked to ostensibly toxic antiperspirants: breast cancer and Alzheimer’s. However, we must filter out the Internet rumors and get to the bottom of the matter. In short, there is currently a need for reliable evidence that supports a connection between deodorant and cancer or Alzheimer’s. There are a lot of suspect ingredients lurking in drugstore deodorants. Many underarm products contain aluminum salts, propylene glycol, synthetic fragrance, and parabens—none of which I want in that delicate area extremely close to my lymph nodes. But finding a natural deodorant that really works is difficult because the natural formulas don’t contain the substance that blocks sweat glands: aluminum salts. These salts react with the water in sweat to create plugs that block sweat ducts, and sweat is one of the important ways in which the body excretes waste and toxins. As their name implies, antiperspirant deodorants aim to prevent the body from sweating. They typically contain aluminum compounds, which are among the few substances that plug the ducts. Remember, the sweat itself is not what causes odor; the bacteria that breeds when sweat has been sitting in your armpits for a while is what stinks. If you absolutely don’t want to sweat at all or if you have a nerve-wracking meeting or want to wear a silk blouse to a special event, you might want to use an antiperspirant to keep you as dry as possible. Non-antiperspirant deodorant only deals with the odor and won’t stop the sweating, which, in my opinion, is much healthier. Most truly natural deodorants fall into this category. I look for deodorants formulated with pure essential oils, aloe, and zinc oxide. Underarm pastes are a type of deodorant that have become really popular. They come in a jar, so you scoop out the paste and rub it into your armpits. Most pastes are formulated with baking soda or arrowroot powder, which helps to minimize wetness, and a blend of essential oils that combat bacteria and provide a pleasant aroma. There are only a handful of companies that currently sell underarm deodorant paste, but it is relatively easy to make; the following recipe will help you get started. Place the coconut oil and the shea butter in a double boiler over low heat and stir until it has all melted. Remove from heat and whisk in the baking soda and the arrowroot powder. Stir in the essential oil, then pour into the jar. At room temperature, the deodorant will be soft; if you want it to be more solid, keep it in the refrigerator. Store in a cool, dark place and use within six months. This article, originally titled “Deodorant: The Great Debate,” is adapted for Well Being Journal from the book Gorgeous for Good: A Simple 30-Day Program for Lasting Beauty—Inside and Out, by Sophie Uliano, published by Hay House (2015) and available at all major bookstores. 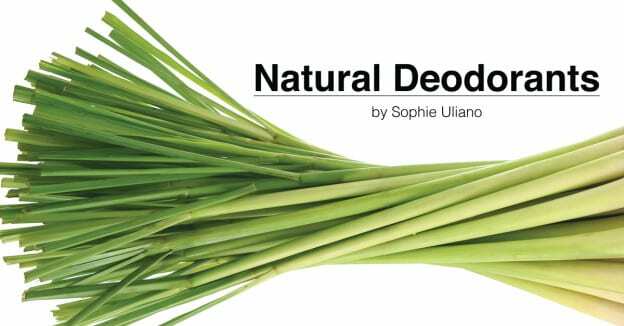 Sophie Uliano is the author of Gorgeously Green, Do It Gorgeously, and The Gorgeously Green Diet. Her website, http://sophieuliano.com, brings together a community of like-minded women and provides in-depth articles, reviews, beauty picks, recipes, and more covering the latest beauty trends. More at http://facebook.com/gorgeouslygreen and http://twitter.com/sophieuliano. This article originally appeared in Well Being Journal, Vol. 24, No. 4 July/August 2015 (available in print or digital format).